Prosecutor will help out speeders. The Tracy Prosecutor is friendly and willing to work out deals for speeding tickets. Tracy has court on Thursday evenings. Tracy will amend to a defective equipment which is a non moving violation and will not be reported on your driving record. A defective equipment will cost you between $150.00 and $225.00. My charge for Tracy is $175 per ticket. Visit About Us for more about our process. According to the United States Census Bureau, the city has a total area of 0.2 square miles (0.6 km²), all of it land and a booming population of 213 people. 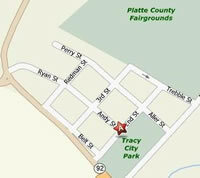 Tracy is located along the beautiful Platte River. An affordable place to live, median rent in Tracy, at the time of the 2000 Census, was $267. Monthly homeowner costs, for people with mortgages, were $869. The average commute time for Tracy workers is 26 minutes which is exactly the same as the national average! They have had problems with their water tower in recent years which caused a bitter election for Mayor.